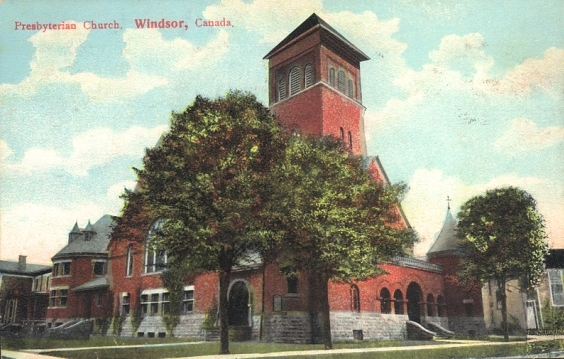 A little after the turn of the twentieth century, the church on the southeast corner of Park Street and Victoria Avenue in downtown Windsor boasted the largest congregation by membership in the Presbyterian Church in Canada. As immigrants from Scotland began to flood the infant settlement in the early-to-mid nineteenth century, it became critical that the Scottish community obtain a place to worship according to its native traditions. In the 1840s, a Church of Scotland of the Presbytery of London, Canada West mission existed in Richmond (a small community on a tract of land between Glengarry and Crawford Avenues). In those early days, services were led by missionaries or divinity students and held in the Old Ward School on Chatham Street. When that space could not be obtained for whatever reason, worshippers gathered in a room above John McCrae's store, which the municipal government also used as the Council Chambers until Windsor constructed its first town hall. With such small numbers, it was difficult for the Scottish community to secure a permanent minister; the usual practice was to bring in a preacher, missionary, or divinity student from a nearby community. Rev. Robert Peden of Amherstburgh, for example, began ministering to the Richmond community in 1845, and served until his dismissal from the London Presbytery in 1850. After that, Rev. 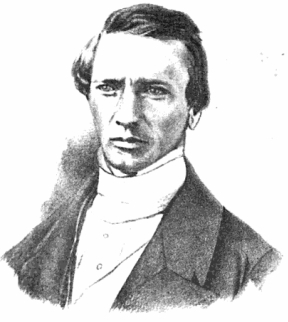 John Hogg of Detroit began to minister to Richmond. Sometimes, however, no minister, missionary, or student could be secured at all; on such occasions Alexander Bartlet would take the pulpit. Alexander Bartlet was devoted to his faith and was a firm believer in the power of education. When he arrived in Windsor in 1853, he joined Congregationalists J. W. Blackadder and John McCrae, who had been running a Union Sunday School at the corner of Pitt Street and Windsor Avenue since 1847. In 1857, Bartlet succeeded Blackadder as Sunday School superintendent, and remained in that office until 1893. The same year Bartlet took over leadership of the Sunday School - ten years before Canada became its own nation - the twenty-nine members of the Windsor Scottish Presbyterian community petitioned the London Presbytery of the United Presbyterian Church of Canada for their own congregation, separate from United Presbyterian Church of Scotland congregation in Detroit, with which they were affiliated. 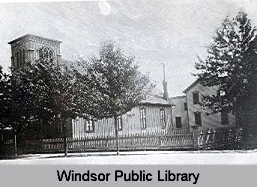 Windsor had just been incorporated as a village three years earlier, its boundaries running from Dougall Avenue on the west to Glengarry on the east, and from the Detroit River to Chatham Street. Roughly one thousand people lived there. London granted Windsor its congregation on the first of July, and gave Rev. John Hogg of Detroit pastoral supervision. On the evening of the Sabbath, 12 July 1857, the new congregation of St. Andrew's met to elect its first Session (governing body), and chose Alexander Bartlet to be the Session Clerk. Bartlet was also elected as one of the two church elders along with David Johnston. The two men were ordained to the office on 2 August, and at a Session meeting the following day decided that the congregation's first Communion would be held on the third Sabbath of September. The first communion roll numbered three more people in addition to the original twenty-nine petitioners. 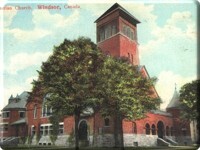 Those founding members of St. Andrew's Presbyterian Church of Windsor were: Alexander and Helen Bartlet; Mr. and Mrs. James Fisher; Elizabeth Browning; Mr. and Mrs. Walter Shoreland; John Webster; Archibald and Janet Napier, Mr. and Mrs. Archibald Brown; Mrs. MacLister; Mrs. MacEwan; Mr. and Mrs. John Davie; Mr. and Mrs. George Grant; Mr. and Mrs. William Sturgeon; Mr. and Mrs. David Johnston; Mr. and Mrs. Charles Page; Mr. and Mrs. David Haggert; Mr. and Mrs. Charles Haggert; Janet Haggert; George Duncan; William Bartlet; and Alexander Stuart. 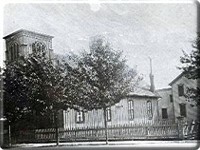 Despite having no permanent minister, the congregation decided in 1864 that it was time to construct a church building. That April, James Dougall donated $100 worth of property on the corner of Chatham Street and Victoria Avenue for the grounds of the new building, while Alexander Bartlet and Donald Cameron spear-headed the mission of collecting funds for its construction. The foundation of St. Andrew's was laid on 21 September 1864. Final details, such as lamps, carpeting, and a marble table, were in place by the end of September 1865. In June 1865, the congregation of St. Andrew's boasted forty adherents, forty-eight members, and twenty-five to forty families, with an average of seventy-five people attending Sunday services. These members enjoyed the communion for the first time in the new church on 10 December 1865, with Reverend Robert Scott presiding. On the evening of 30 March 1866, Alexander Bartlet and some other elders arrived at the train depot to meet Reverend Alexander Kemp, who had come from St. Gabriel's Church in Montreal. Kemp made an agreeable first impression with Bartlet, who described him in his diary as "a very fine looking man and a very fine off handed fellow. He seems to be a complete gentleman in every sense of the word and a thoroughly mild benignant way with him." 3 The session was equally impressed with Kemp's business sense: "He seems really very able and one of the very best business men I have met up with yet," Bartlet wrote. 4 The new reverend was inducted at St. Andrew's on the evening of 9 May 1866, with Mr. Thompson of Sarnia preaching the sermon and Mr. Balmer presiding. During Rev. Kemp's term, the congregation added three more elders - Donald Cameron, Albert McMicken, and James Bartlet - and sixty-seven new members added to the Communion roll. It was also during Rev. Kemp's ministry that the church obtained its first instruments. 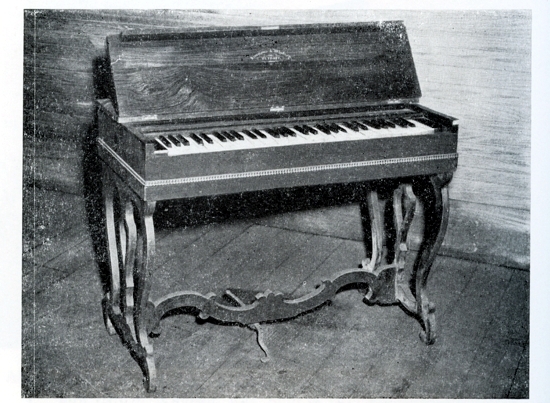 Although there were differences of opinion as to the propriety of this move, the congregation formally approved the introduction of a melodeon in 1868. 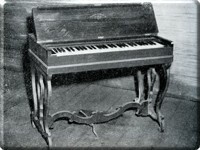 Alexander Bartlet, who lived directly across the street from the first church, carried the miniature organ into the church every Sunday for a number of years. "For a time I was the only ordained minister of the Presbyterian Church in the County of Essex. The same state of affairs existed in other parts of the Presbytery of Chatham, a shortage which had the compensation of binding the labourers together in the work given to them by the church." "In 1871 I had the privilege of becoming a member of the historic General Assembly in Quebec. Then the question was asked if the separate branches of the Presbyterian Church throughout the Dominion could not re-unite. The answer came in 1875, when that re-union was realized." "Meantime, changes were taking place in the development of Windsor. The Canadian Southern, ultimately an important branch of the Michigan Central Railway, was built and an extensive system of drainage undertaken. No longer was it necessary to ride horseback when visiting some of the neighbouring towns, for example, sixteen miles between Wallaceburg and Chatham." "Later, the street car, Windsor being the Canadian pioneer in that respect, improved communications. Still, for the most part, the distance between Windsor and Walkerville and between Windsor and Sandwich, was covered on foot on evenings when I held weekly cottage prayer meetings in those places. Sometimes an elder accompanied me, but in any case, my blackthorn stick went along. Never was I obliged to use it in my defence although, at that time, the road was a lonely one." "The wooden church, next door to which a manse had been added in the third year of my ministry, made way in time for a substantial brick building. The opening and dedication of that new St. Andrew's was a proud occasion for both the congregation and myself." As Rev. Gray said in his memoir, the congregation broke ground for a new brick church at Victoria Avenue and Chatham Street in 1883, and completed it in 1884. The frame building was relocated to the back of the new church and was used as a Sunday School. While the congregation waited for the brick church to be completed, it met in the Opera House on Riverside Drive East. Rev. Gray's fruitful twenty-three year service helped the community to grow and thrive in other ways, too. When he answered the call in 1870, there were fewer than 125 names on the Communion roll. When he left in 1893, there were 450. It was during his term that it became the custom of the St. Andrew's pastor to act as chaplain to the 21st Essex Fusiliers, and to join the Ministerial Alliance of Detroit. After Colin MacDonald immigrated from Scotland in the early 1870s, Rev. Gray invited him to be the church's choirmaster; St. Andrew's first regular soloist would direct the choir for over thirty years. The first women's groups were also established during Rev. Gray's term, with Ladies Aid and the Women's Missionary Society both forming in 1877. Even Windsor itself was experiencing a great transformation as men began to experiment with the "horseless carriage," the community's population boomed to ten thousand, and Victorian ideas died out. 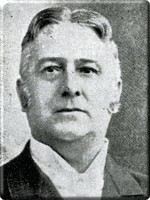 Reverend James C. Tolmie, an 1888 graduate of Knox College, embodied the type of change that would overtake the twentieth century. He succeeded Reverend Gray in 1893, and quickly won the congregation over with the warmth of his personality, his easy-going nature, and his "genuine and personal regard for everyone's interests." However, disaster struck the community less than two years after this new pastor arrived. On the afternoon of 16 May 1895, a fire completely consumed "the twelve-year-old brick church which was the pride and joy of the congregation." Only the cement sidewalks leading into the building were left intact. "But," wrote Historian Committee Chair Angus Munro in the church's centennial publication, "as so often happens with congregations in similar circumstances, the faith and courage of the people rose to the occasion. Hardly had the fire cooled when plans were underway to rebuild." The building committee for the new church was chaired by Alfred Joyce, and included such community notables Noble A. Bartlet, Alexander Gow, George Bartlet, R. F. Sutherland, and William McGregor. James Anderson, William Riddle, H. C. Flemming, David Johnston, Pascal McLeod, James Kenning, George White, and Alex Black made up the rest of the committee. The Romanesque brick building was originally designed to seat eight hundred attendants; Elder James Lambie funded a gallery to seat one hundred additional people. According to the contractors, Kulo and Hild of Detroit, the enterprise cost $30,000. "A microfilm record of one written impression of the time said of the new building effort and the new church (our present home): 'It has rise, phoenix-like, from its ashes - an elegant monument to Presbyterian enterprise.'" 6 Dedication of the new church on the corner of Victoria Avenue and Park Street was held one year later, Sunday, 14 June 1896. Perhaps Bartlet's passing marked the end of an era; perhaps it signaled the start of the great upheavals that were about to rock the core of Western civilization. 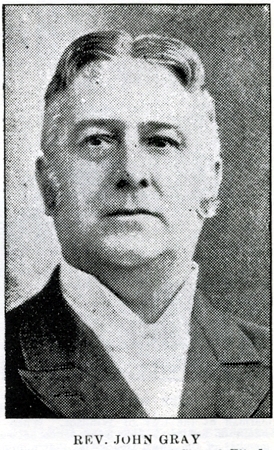 In 1914, Rev. Tolmie, much like political icon Tommy Douglas, decided that he could serve a greater number of people in the political sphere. He won a resounding victory in the provincial elections, defeating two Conservative candidates to become the Liberal member for Windsor in the Ontario Legislature, and retired from St. Andrew's in 1915 before Parliament opened. After spending just two years in Toronto, Tomlie went overseas with the Essex Fusiliers to serve as chaplain for the 99th Battalion of the Canadian Expeditionary Force. After he returned home from the war, St. Andrew's minister Emeritus went on to become the finalist in the provincial Liberal Party Leadership Convention in both 1919 and 1922. After that, he left politics to return to the ministry in his hometown of Southampton in Bruce County. Born in 1881 to farmers William Paulin and Mary Cameron, Dr. Paulin came from Arthur, a humble community in Wellington North. To pay his way through Knox College, University of Toronto, and a year abroad in Scotland, he taught school. His first pastorate was at Chalmers Church in Woodstock, where he spent six years before answering the call to come to St. Andrew's. At thirty-five years of age, he found himself thrown into the midst of the city's most turbulent and most progressive era to date. The Detroit-Windsor auto industry attracted people by the thousands during the 1920s, almost causing the city to burst at its seams. Dr. Paulin was able to make these people feel safe and secure in their new environment, and the St. Andrew's congregation experienced constant growth in the Communion roll and regular attendance. His Sunday night sermons were directed to those who might have felt lonely or homesick, and needed the comfort of a church community. One newcomer praised the minister's eloquence: "Dr. Paulin makes me feel as though I have just had a visit with the homefolks." Through Dr. Paulin's leadership, St. Andrew's grew into the largest Presbyterian congregation in the entire nation, its membership boasting more than 2,000 at the time of his death in 1952. With the burning desire to expand St. Andrew's influence in the Windsor community, it was also under Dr. Paulin's influence that the branch churches, Knox, Westminster, and Riverside, were built. He was also instrumental in the establishment of the Hungarian Presbyterian Church. 1925 brought difficult times for the Presbyterian Church in Canada. That year, three Protestant denominations - Presbyterian, Congregational, and Methodist - merged to for the United Church of Canada. Two-thirds of Canada's Presbyterian congregations split from the Presbyterian Church and joined with the new United Church; the vast majority of St. Andrew's members, however, rejected the union and chose to remain within the continuing Presbyterian Church in Canada. The minority who chose to go United went to the Westminster Church, at which Dr. Paulin was a welcomed guest speaker. St. Andrew's continued to thrive through the turmoil of the Great Depression and the Second World War. The entire community was devastated when it learned that Dr. Paulin had died unexpectedly of a cerebral hemorrhage on 8 October 1952. He had been preparing to join a friend for a round of golf at the Essex Golf Club and complained that he was not feeling well. Before he left, he collapsed in the manse and was rushed to Grace Hospital, where he passed away a few hours later. A pulpit supply committee named Rev. Dr. William Lawson of Knox Church, Leamington, interim moderator following the death of Dr. Paulin. After spending a year searching for a permanent pastor, the congregation asked Rev. Lawson to answer the call. He accepted, and was inducted on Tuesday, 1 December 1953 at a service attended by 1,200 people. Rev. Lawson had been born in Dundas, and, like his predecessor, was educated at Knox College, graduating in 1947. As a student he assisted at Glen View Church in Toronto, then spent three years in Alberta before returning to Ontario. He was called to St. Andrew's three years into his service at Leamington, where he had begun his involvement in the Essex County Children's Aid Society (of which he later became president), the Rotary Club (which he attended weekly), and the John Howard Society. Rev. Lawson continued his community involvement in Windsor, adding the Windsor YMCA-YWCA to the list of organizations he supported. Inspired by the minister who had come before him, Rev. Lawson initiated the establishment of the Dr. H. M. Paulin Memorial Extension Fund, founded as a living memorial to the beloved former pastor. The fund, which exists to assist in the establishment of new churches and to aid growing churches in the Windsor area, gave the Paulin Memorial Presbyterian Church a $25,000 gift and a $25,000 loan to help with its formal creation in 1953. Loans were also given to Knox Presbyterian to help the church erect its new building in the middle of the decade. Rev. Lawson shepherded the congregation through its next twenty-eight years, finally retiring in 1981. When he passed away around Christmas in 1987, the whole community felt the loss. Rev. Lawson had been an instrumental force at St. Andrew's, having assumed its leadership of the downtown congregation during the flowering of suburbia. When he came to Windsor in 1953, membership was declining for the first time in the church's history. Rev. Lawson's dedicated preaching and teaching helped to replenish the numbers. Although he "wasn't a pulpit thumper and he did not have a big booming voice," he did possess "a special gift to prepare and deliver a sermon that would speak to an issue or situation with precise polish, thoughtful composition, or forthright delivery." 10 Rev. Lawson also knew that sometimes, in times of need or crisis, words were not enough. On such occasions he gave the members of his flock the quiet, comforting strength of his presence. Children appreciated his succinctness. During one Children's Day service on a sweltering June day in the 1950s, he approached the lectern to deliver "The Minister's Address." "The Minister's address is 425 Victoria," said Rev. Lawson, and he returned to his seat. In the post-war era, the growing church welcomed a host of new clerical workers. Deaconess Charlotte Farris arrived in 1949 and dedicated the latter half of her ten-year term at St. Andrew's to missionary work with the burgeoning Chinese community. In 1954, the church gained a pastoral visitor in the form of Rev. 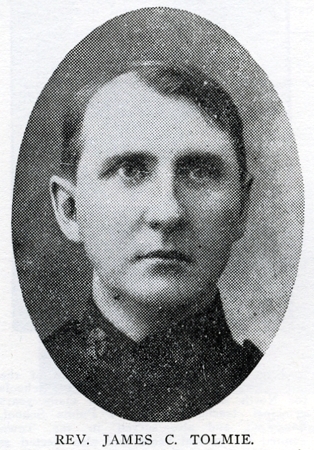 Donald MacLeod of Bruce County. "The warmth of his personality, his genuine interest in the welfare of those who are ill or hospitalized, and his rare gift for friendship" quickly endeared him to the congregation. After he passed away in 1960, Rev. 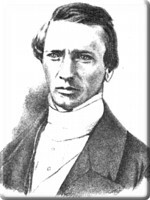 Donald Paterson, a native of Ayrshire, Scotland, filled the vacant position of pastoral visitor. Many other clerical workers served under Rev. Lawson, including pastoral visitor Rev. Charles Dougan (1963-1967); assistants to the minister Rev. Leslie Barclay (1960-1962), Rev. Ted Siverns (1969-1971), and Rev. Joseph Riddell (1971-1974); assistant ministers Rev. Hans Zegerius (1964-1969) and Joseph Riddell (1978-1981), who returned to St. Andrew's after a four-year stint in Wallaceburg; and missionaries to the Chinese Elsie Lee (1959-1966), Rev. James Yee-Lai Ko (1965-1971), and Rev. David Chan (1972-1984). Rev. Robert P. Fourney became St. Andrew's pastor after Rev. Lawson retired, serving the congregation from 1982 until 1996. Rev. Dr. Jeff Loach ministered from 1997 until 2004. Rev. Jennifer Cameron, who had been an associate minister since 2002, presided at St. Andrew's until 2006 as its first female pastor. The congregation celebrated its 150th anniversary in 2007, commencing the occasion with the induction of its ninth Senior Minister, Reverend Ronald Sharpe, who arrived from a ministry in Cape Breton, Nova Scotia. From a tiny thirty-two-member congregation in the newly-incorporated village of Windsor, St. Andrew's Presbyterian Church has grown to become one of the city's most prominent places of worship. Few who pass this downtown landmark are aware of its old Scottish roots - but the again, Scottish tradition is so ingrained in Windsor's daily routine that it is easy to take for granted.